It’s that time of year again and I’m not talking about The Nutcracker (although it is coming up – Joffrey‘s opens next Friday!). Dance Advantage is hosting the 2nd Annual Top Dance Blog contest!! Last year RB barely lost in the Dance News/Criticism category, but tied for 5th place overall. With your help, I know this year we can do better. This year RB will be in the Speaking Dance category. All you need to do is make a comment *ON THIS POST* telling why you read RB, what you like about it, a favorite post…anything. The first round of voting (by comment amounts) ends Tuesday, December 20th. 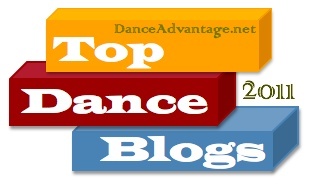 The top 20 blogs with the most comments will then be entered as a finalist to be the TOP DANCE BLOG OF 2011. Voting for the top slots will take place December 27 – 30, but right now, RB needs you to comment away. Thank you in advance for all of your support. Again, all you need to do is leave a comment below ON THIS POST. Let’s go! This entry was posted in contest, Top Dance Blog 2011 by Vicki. Bookmark the permalink. I visit the Rogue Ballerina blog when I want to know who’s who in the Chicago dance scene, and I always find plenty of meaningful content there! Love Rogue Ballerina, she provides details and puts a human face on the oh-so-human art form of dance. Look forward to reading each post! Rogue Ballerina is the best! Great blog. I love Rogue Ballerina!!! Rogue Ballerina covers dance performances and gives insight from a dancers view, as well as the choreographer’s view. The Rogue Ballerina is doing such a great job covering dance here in Chicago!! Thank you! I dig Rogue Ballerina. She rawks and her logo is supes cute. The Rogue Ballerina is working hard to raise the profile of Chicago’s vibrant dance community! The world of dance media has changed so much in the past few years. Rogue Ballerina is a blessing these days. The blog’s enthusiastic coverage of all dance outlets – regardless of size or popularity –is refreshing! Rogue Ballerina is an AMAZING blog! So informative, fresh and dance newsworthy! Witty and charming! I love it! I love ballet and love dancing so it’s only natural that I follow this blog that keeps me informed on the latest buzz. Love this site and love Vicki. She knows everything about the dance world. Rogue ballerina is a great blog!!! Vicki should win!! I Love Rogue Ballerina! Funny and smart and always an interesting read. Keep it coming, Rogue Ballerina! Without a doubt my favorite blog out there!! I’ve been a dancer ever since I could walk and I thought I knew more than anyone until I started reading – Vicki you have me hooked! You’re incredible, keep it up! I love your blog, Vicki! Please keep them coming. Don’t ever stop! Rogueballerina keeps me current with dance and keeps dance in my life!! Rogue Ballerina is by far my favorite dance blog! Keep up the good work, Vicki! Rogue Ballerina is fabulous. Vicki does such a great job of keeping us all in the know! Vicki does an amazing job bringing dance into my world! Could Vicki know any more? I think not! Thank you, Vicki for everything you do! Rogue Ballerina is the best! Vicki Crain really knows her stuff. She brings fun, insight, warmth and energy to all the shows she writes about. It is a HUGE benefit to the dance community to have her voice present. Vicki is amazing! Rogue Ballerina is fantastic! Rogue Ballerina is the go-to blog for those looking to stay updated on the dance industry, especially in the Chicago area. Vicki’s posts are fresh, fun and informative! Love it! Rogue is a great blog, with great insights! So nice to have a fresh new voice covering Chicago’s dance scene, someone who truly makes a point of plugging herself into the community! I love this blog! So fabulous! Love Rogue Ballerina! What an awesome voice for dancers!!! Congrats on the blog, Vicki. It is pretty great. You can read her passion in every blog! Rogue Ballerina is a great blog and gives the reader insight into the dance community. Love your blog! It is awesome! Rouge Ballerina approaches dance with both a knowledgeable approach to the scene and a sensitivity to people who would like some additional background and information — which shows her insight, sensitivity and passion for dance. Thank you RB! What a wonderful blog – I so enjoyed reading! Such a great blog and blogger!!! Rogue Ballerina “gets it!” – That is – she really sees the forrest and not just the trees – the whole album and not just the snapshot – fair – comprehensive – informed – everything you expect from a critic! Bravo tot RB! i get a lot of my dance news from Rogue Ballerina!! LOVE the site!! Rogue Ballerina is the best!!!! Rogue Ballerina is *the* best source for information on the dance scene. I simply can’t stop reading it! I laugh, I cry… It’s better than CATS! I check this blog weekly, I love hearing reviews of shows, I love the interviews, and pictures! rogue ballerina is a great blog with excellent taste and a discerning eye! the chicago dance scene is lucky to have her!! For all things Chicago Dance, it’s Rogue Ballerina! GO R.B.! This dance blog is well written, insightful, and accessible to those that are not experts in the dance scene! Well done! Voting for you, as requested. If you ask, I will serve the Rogue Ballerina. Rogue ballerina is my favorite!!!! I love this blog! I don’t live in Chicago, but RB helps me plan my trips to the city based on the valuable critiques of the performances. Incredible interviews with Dance’s Best! Love Rogue Ballerina! I love the interviews and I check the website regularly to plan what shows I am going to see! LOVE rogueballerina.com !!!!! I read it all the time! I’m far from being a dancer, but I’ve always been obsessed with Dance! RB’s been a great resource and source of inspiration on Chi-town’s Dance community. Merci. Love Vicki Crain and ROGUE BALLERINA! We were thrilled that Vicki joined the Chicago Dancing Festival in 2011 as part of our inaugural Blogger Partnership program. She loves dance and we love her! Best way to keep up with dance in Chicago!!! I recently found this blog through a friend and I’m glad he introduced me to it. I love Rogue Ballerina’s perspective on dance!!! Vicki does a great job. Informative, talented writing with a true knowledge, respect and passion for the art of dance. Bravo!! Love getting updates from Rogue Ballerina! Best blog to keep updated on the dance world!! I see Rogue Ballerina at performances all the time, so I know she’s out there covering a ton of dance–thanks! She’s intouch with what’s going on in Chicago and in the dance world at large. Love rogue ballerina . I look forward to all of Rogue Ballerina’s posts covering the diverse Chicago dance scene! Yay Rogue Ballerina! Love this blog! Very accurate fresh and fun approach to Chicago dance scene. I love Rogue ballerina! Rogue Ballerina is my fave!